The Mexican government announced Friday that it has reluctantly agreed to assist President Donald Trump’s administration in implementing a policy under which some migrants who have applied for asylum in the United States will be returned to Mexico pending their hearings in American immigration courts. 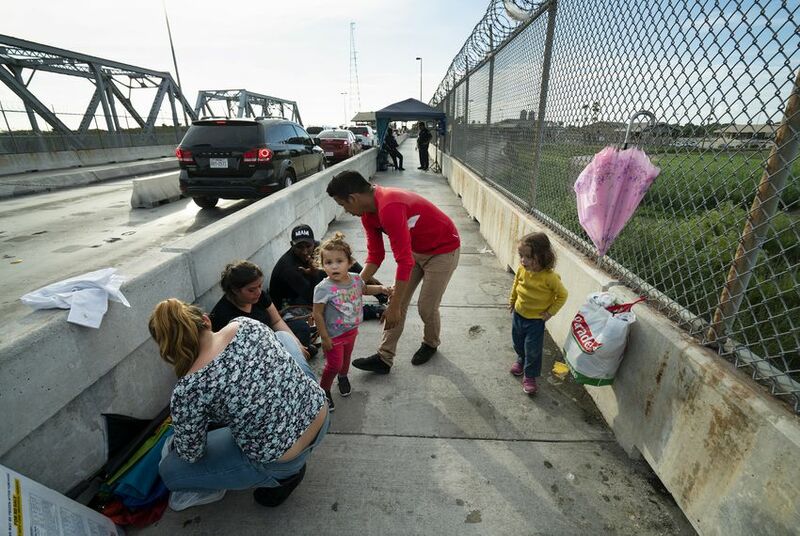 The program, which will begin in California at the San Ysidro border crossing and could expand to border crossings in Texas, was largely criticized by immigration attorneys and human rights groups, who said the policy could prevent immigrants from retaining attorneys and endanger their safety by forcing them to stay in violence-plagued Mexican border towns. At the same time, the Mexican government has accepted more than 10,000 humanitarian visa applications from Central Americans, including some who are traveling as part of a caravan headed toward the United States. If granted, the visas would allow them to travel through the country and reach the U.S-Mexico border without the risk of being deported by Mexican immigration officials. The two actions indicate that Mexico hasn't completely bowed to the Trump administration and suggest that Mexican President Andres Manuel Lopez Obrador — who took office Dec. 1 — is still grappling with how to deal with his counterpart in Washington, analysts said. “It’s not a cohesive message on anything. You have, on the northern border, a policy which is in essence providing the Trump administration what they want [as] Mexico becomes a waiting room for Central Americans,” said Stephanie Leutert, the director of the Mexico Security Initiative at the University of Texas at Austin. “It seems that the Mexican government is really divided by this." Meanwhile, the migrant caravan, the third in the past year, is making its way through Mexico from Honduras and headed to the United States. It formed nearly two weeks ago and has drawn the ire of President Trump, who said the caravan is another reason the U.S. Congress should fund his long-promised wall on the southern border. The Mexican government also has offered work visas to some migrants, allowing them to work in Mexico’s southern states but restricting travel to other parts of the country. Duncan Wood, the director of the Mexico Institute at the Woodrow Wilson International Center for Scholars, said he expected the Mexican government to clarify its positions on how it will handle the continued influx of Central Americans into Mexico and the Trump administration's latest policy. Ruby Powers, a Houston-based immigration attorney and member of the Texas chapter of the American Immigration Lawyers Association, said that vulnerable populations, including LGBTQ immigrants and families with small children, are the most at risk by remaining in dangerous Mexican border cities, where kidnappings, shootouts and murders by warring drug cartels have become common. During a Friday press conference, Roberto Velasco, an official with Mexico’s Foreign Relations Secretariat, said that Mexico will accept 20 migrants from the United States each day who crossed at the California port of entry. But the country “doesn’t agree with this unilateral move,” the Associated Press quoted Velasco as saying. The Mexican government said it won’t accept certain migrants, including those whose asylum cases are on appeal, unaccompanied children or migrants with health problems. The Washington Office on Latin America, a nongovernmental human rights watchdog, warned that if the program is expanded across the U.S.-Mexico border, it would endanger more Central Americans fleeing violence in their homelands — more than 127,000 of them were apprehended at the border in fiscal year 2018 alone, the group said — and strain Mexico’s limited resources and infrastructure. “Sending even half of this amount of asylum seekers back over the border, plus individual men and women from Central America and elsewhere who are presenting themselves for asylum at the U.S. border, would place an enormous burden on Mexico,” the group said.